Never before have managers been under such pressure to juggle the responsibilities of leading their teams to high performance and simultaneously responding to ever-increasing demands to maintain a psychologically safe work environment. In Trust Your Canary, popular speaker, consultant and writer Sharone Bar-David inspires managers to confidently identify, prevent and tame workplace incivility. A first of its kind, this hands-on comprehensive resource is the ultimate guide for leaders wishing to cultivate a respectful and productive workplace environment. For more than twenty years, Sharone Bar-David has provided training and consulting services across industries. 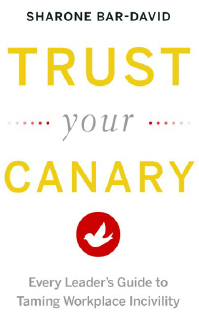 In Trust Your Canary, she brings decades of experience to even the trickiest of situations and offers enlightened support. She compels us to create the kind of workplace we all aspire to: one that is respectful and thriving with abundant productivity.